What are the Best Materials for Acoustic Guitar Bridges? The bridge of any guitar is a very important component both in terms of functionality and sound. Below I will cover the best materials for acoustic guitar bridges. But first let’s have a look the components of the bridge and how it works. The bridge has a couple of major functions. Firstly the bridge is, or more accurately the bridge’s saddle is, an integral piece of the guitar for controlling the action of the guitar (i.e. how far off the fretboard the strings sit), in cooperation with the nut at the other end of the guitar. One of the bridge’s other important jobs is to transfer the sound from the strings into the soundboard of the guitar. Finally the bridge plays a big part in holding the strings of the guitar in place. The bridge, bridge saddle and bridge pins are obviously integral parts of the workings of the guitar, so the materials used need to be up to these tasks. The bridge has a few different components and each of those components can vary in the material used. A steel string acoustic guitar is made up of a bridge, bridge saddle and bridge pins. A nylon string classical guitar has a bridge and bridge saddle but doesn’t typically have bridge pins. Strings are usually tied to the bridge. Even nylon strings with ball ends usually just sit in the bridge and don’t have bridge pins. This is because they aren’t needed – the tension of steel strings is much greater than the tension placed upon nylon strings. O.k. let’s go through each of the components of the bridge and see which materials are best for each part. Whilst most discussion tends to focus around the bridge’s saddle and to a lesser extent the bridge pins, the material of the bridge itself is also important. Almost always the bridge of an acoustic is made of wood (electric guitars bridges are almost always made from metal). The type of wood is important. As mentioned above the bridge transfers the vibrations of the strings into the soundboard. This energy transfer needs to be as efficient as possible – that is to say that we want as much of that energy to transfer into the soundboard as possible. For this reason hard dense woods are needed for the bridge. With softer more flexible woods too much energy is lost in transmission. The most common woods used for bridges are rosewood and ebony – for the reason that these are hard, dense woods. Acoustic bridges also shouldn’t be too heavy and these woods seem to fit the right balance of being hard but also being light enough. Sometimes the decision for which wood to use will come down to aesthetics – i.e. matching the bridge’s wood to that of the sides and back of the guitar or to the fretboard. But the most important consideration is the hardness/density of the wood. This not only makes for better energy transfer to the soundboard but is also more durable and since the bridge is up against highly tensioned strings (particularly with a steel stringed guitar) it needs to be tough. Some bridges are also made from artificial materials these days. Usually you won’t have to replace your bridge unless you get a very cheap guitar. Chances are you will get a rosewood or ebony bridge. Like with the nut of the guitar, as discussed here, the bridge plays an important role both tonally and in terms of intonation and action. Unlike with the nut however, the saddle has another important function. Remember that one of the bridges most important jobs is to transfer the vibrations of the strings into the soundboard? Well, part of that job is delegated to the saddle. For this reason density/hardness is also very important for the saddle so that minimal energy transmission is lost. The material of choice for bridge saddles seems to be bone because of its tonal qualities, sustain and its hardness. There are a number of options though. Plastic: Cheap plastic saddles are probably the first thing you should replace if your new guitar comes with one of these. They are soft (compared to other saddle materials) and with time will wear away affecting your action. The softness of plastic will also absorb a lot of the energy transfer, meaning less loudness and clarity of sound making it to the soundboard. Attack and sustain of the notes played will also be compromised. ‘Flash’ Plastics: Synthetic materials such as TUSQ, Nubone and Micarta are a step up from cheap plastic materials and are a much better option. Saddles made of these materials will often be slightly cheaper than bone and some argue that it is more consistent than bone because bone’s density can naturally vary. A ‘flash plastic’ (not the technical term by the way!) saddle won’t look as nice as a natural bone saddle, is not quite as hard and arguably the tone isn’t quite in the same league – though that’s quite subjective. Bone: Speaking of bone. Bone is the standard in high end guitars – and for good reason. It’s hard and dense so it’s durable, it transfers sound to the soundboard very efficiently and is, in the opinion of a lot of people, tonally superior to other saddle materials. It is slightly more expensive too but when it comes to saddles this might just be the difference between around $15 for a decent synthetic saddle and $25 for a bone one. The only other real downside of bone is that it may not be as consistent as the consistency of the material cannot be controlled as it can be with synthetic materials. The other thing to consider with bone is the quality of the guitar. Bone is great for nice guitars as it brings out the great tones of that guitar. If you have a cheaper guitar it may not be beneficial to amplify it too much! Bleached Bone vs Natural Bone: Bone is sometimes bleached for aesthetic reasons. If you are going to go with bone, natural bone is definitely recommended. Bleaching of the bone results in some loss of hardness and takes away some of the natural lubricating properties – which can cause strings to stick to the saddle. There isn’t much difference in price between natural and bleached bone so I would go natural if you can. Fossilized Ivory: As with nuts Ivory is a great material for saddles. It is hard and dense but can produce a more mellow sound if bone is too bright for you. This is also the most expensive material as it is harder to source. These saddles are harder to come by and more specialized than the others. Please note that non-fossilized ivory is illegal. Fossilized ivory is sourced from animals that died millions of years ago from natural causes. Non fossilized ivory is often the result of poaching and the killing of endangered species. Some guitars are made with cheap plastic saddles to save costs. A bit of a pain but the saddle is one of the easiest parts of a guitar to replace so it’s worth doing if you have a cheap one on your guitar. Finally we come to bridge pins. Bridge pins come in much the same materials as saddles. However, these won’t make as much difference to the sound as the saddle does. 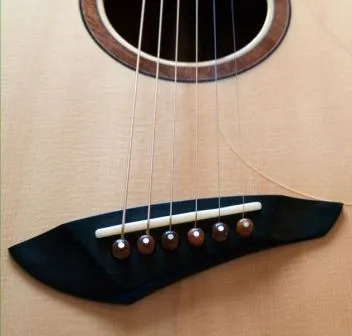 They will make some difference though so it’s worth at least avoiding cheap plastic for these – and cheap plastic ones tend to break easily when you are changing strings. Wood is one different option for bridge pins that doesn’t tend to get used for saddles. However, whilst wood may be a step up compared to plastic, materials such as bone, fossilized ivory and the likes, are still a better choice – if going for wood, then Ivory is your best bet, in my opinion. Bridge pins are super easy to replace – and they often need replacing because often manufacturers will save costs by using cheap plastic. O.k. now hopefully you have a good deal more knowledge about the best materials for all of the components of the bridge. Thanks for reading and I hope this has helped you in your research and made your choice a little easier. What’s your opinion on the best materials for the different components of the acoustic guitar bridge? It’d be awesome to hear what you think in the comments section below. Any other comments or questions also very welcome. OK are you selling this or do you really care about the facts? The web site is not a good web site. Jon Stupka is a much better mechanical engineer than web designer. USPTO utility patent on the DLC PyC. PyC is often confused with the room temperature levitating Pyrolytic graphite. PyC is a DLC, and is a little harder than mild steel. PyC is isotropic, covalently bonded like diamond. The PyC saddles, nuts, frets have no rival i know of. Bone is such a bad conductor you have to have a large mass AKA a tall saddle to produce volume, string gouges bad, and mutes too. No brag just fact, and I am willing to send you a sample to prove it too. Like say a saddle for any Martin spruce, rosewood, dreadnought? I can’t say I completely understood all of that! But I like the sound of a saddle that can’t do those things. Here, I am only talking from my own experience and I obviously haven’t tried a PyC saddle (pyrocarbon?) but it sounds interesting. I’m also curious about what room temperature levitating Pyrolytic graphite is but I’ll leave that to the engineers!